Western Swing your thing? Ready to break out your rockabilly-self and enjoy some Hillbilly Bop? Join us in welcoming, Ethyl & The Regulars, back to The Victoria Tavern. This Saturday, ONE NIGHT ONLY, Ethyl & The Regulars, will get your toes tapping while you enjoy drink specials all night long. 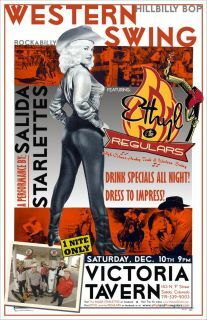 Show starts at 9 pm and will feature a special performance by, The Salida Starlettes. DRESS TO IMPRESS because this is an event you don’t want to miss! O! and at midnight we’ll be toasting, James Brown, as he celebrates the 25th anniversary of his 25th birthday! BE THERE OR BE SQUARE!